We’re not just trying to win a cross-country bike race. We also have the goal of helping to cure blood cancer by collecting $200,000 for the The Leukemia & Lymphoma Society (LLS). Donations to LLS are made through our partner, Team in Training. If you’d like to help our team fight blood cancer, please donate! The Leukemia & Lymphoma Society (LLS) is the country’s largest voluntary health organization dedicated to curing leukemia, lymphoma and myeloma, and to improving the quality of life of patients and their families. LLS was established in 1949 as The de Villiers Foundation. In 2000, LLS changed its name from The Leukemia Society of America to The Leukemia & Lymphoma Society to emphasize its commitment to fighting all blood cancers. Today, LLS supports the following major programs: research, patient services, public and professional education, advocacy and community services. With headquarters in White Plains, NY, LLS has chapter offices across the United States and is a single corporation doing business under New York State nonprofit corporate laws. Nearly 1 million volunteers from all walks of life give generously of their time and talents to implement LLS’s programs. They provide professional guidance and help raise vitally-needed funds. LLS’s activities are directed and supervised by its national Board of Directors and chapter boards of trustees. 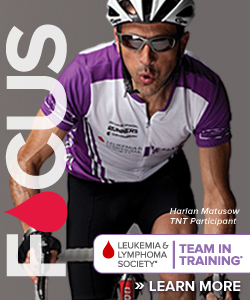 The Leukemia & Lymphoma Society’s Team In Training (TNT) is the world’s largest charity based sports training program. Since 1988, more than 540,000 participants have accomplished their goals of completing a marathon, half marathon, triathlon, cycling century or hiking adventure with TNT. In return, they have raised over $1.2 billion towards the fight against blood cancer in support of The Leukemia & Lymphoma Society.